"To see the future you must look backwards," states the Book of Isaiah. So when I found that the Bible code stated that the Apocalypse was now -that the "End of Days" had already begun, that the real Armageddon might start with an atomic attack on Israel-since I had no way of investigating the future, I began to investigate the past. The closest this world ever came to an Apocalypse, at least since the Flood, was World War II. "World War," "Hitler," and "Holocaust" are all encoded together in the Bible, in the last book of the Old Testament. "This world devastated, World War" is spelled out in a single code sequence, the only time "World War" appears. The names of all the World War II leaders - "Roosevelt," "Churchill," and "Stalin," in addition to "Hitler"-are in the Bible code. All the major combatants, "Germany," "England," "France," "Russia," "Japan," and the "United States," are also encoded with "World War." The year the war began, 1939, is encoded with both "World War" and "A. Hitler," and the word "Nazi" appears in the same place. "The Holocaust" is encoded with 1942, the year that the "final solution," the mass extermination of all the Jews in Europe, was ordered. America's sudden entry into the war, when the Japanese struck Pearl Harbor, is vividly told in the Bible code. Encoded with "Roosevelt" is his title "President," and his December 7, 1941, declaration of war: "He gave the order to strike on the day of the great defeat." "Pearl Harbor" is encoded, and the words "destruction of the fortress" run across it. The naval base is identified as the location of "the fleet." It also appears with "World War" and December 7th-and "Hiroshima." "Hiroshima" is spelled out with a skip sequence of 1945, the same as the year that the bomb was dropped. The impact of that first atomic bomb is also described-"Hiroshima to end shooting whole world"-at the point in Genesis where the plain text states, "And it repented the Lord that he had made man upon the Earth and it grieved him at his heart." 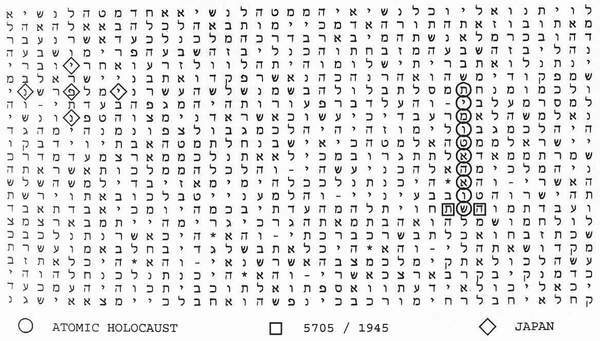 "Atomic holocaust" is encoded with "5705," the Hebrew year equivalent to 1945. The year actually crosses "atomic holocaust" the one time those words appear in the Bible. The immediate danger never seemed more real. 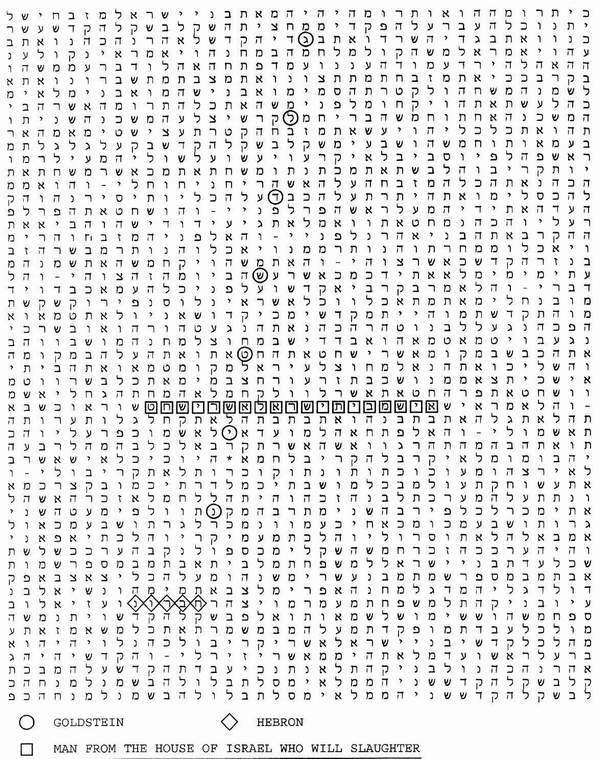 If the last World War was so accurately encoded, then it was impossible to ignore the Bible code's warning of the next war. "THE next war" was encoded in the Bible with a hidden text that stated, "it will be after the death of the Prime Minister." All the assassinations that have changed the course of human history the murders of Abraham Lincoln and Mahatma Gandhi, Anwar Sadat and Yitzhak Rabin, and both John and Robert Kennedy-were foreseen in the Bible. The only time "President Kennedy" appears, the next words in the same code sequence are "to die." The name of the city where he would be shot, "Dallas," was encoded in the same place. "Oswald" is encoded with "name of the assassin who will assassinate." The same words, from the same verse of the Bible, were encoded with "Yitzhak Rabin" and the name of his assassin, "Amir." "Marksman" and "sniper" are also encoded with "Oswald," and there is even a precise description of how he would kill Kennedy-"he will strike in the head, death." Oswald's own death is also foretold in the code. 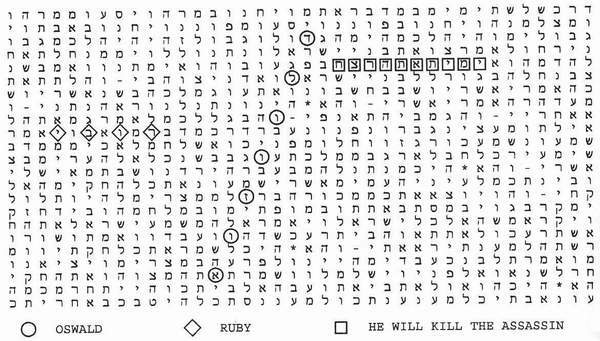 The name of the man who shot him, "Ruby," appears with "Oswald," and the hidden text says "he will kill the assassin." The name of the slain President's brother, "R.F. Kennedy," also appears in the Bible. And the second Kennedy assassination was also predicted. In fact, the two murders are encoded together in the same place. 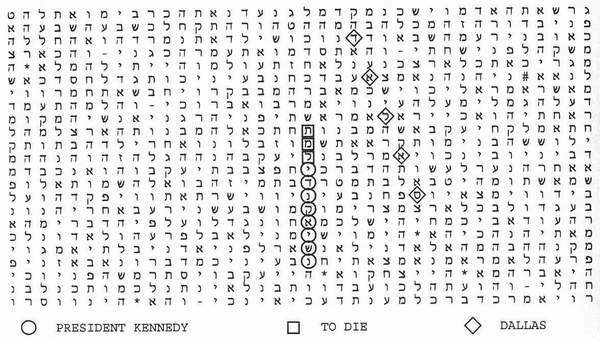 On a single table appear the words "President Kennedy to die"-"Dallas" - "R.F. Kennedy"-"second ruler will be killed." Crossing the name "R.F Kennedy" is the name of his assassin, "S. Sirhan." 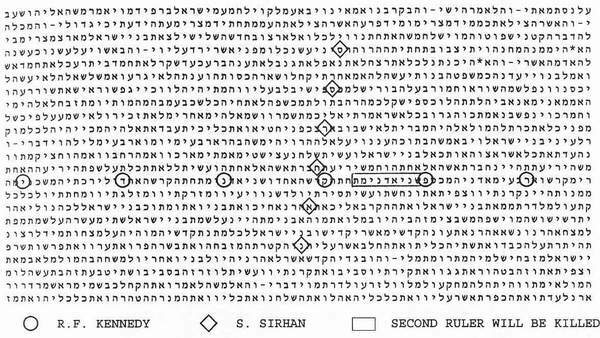 And it is at the exact point that "Sirhan" and "Kennedy" cross that the hidden text states, "Second ruler will be killed." There is a striking pattern to assassinations in the modern world. It is the leaders who bring hope who are killed. And each of the murders is encoded in the Bible. "A. Lincoln" is encoded twice, in Genesis and Deuteronomy. The name of his assassin, "Booth," appears three times in one verse of the Bible that crosses "Lincoln." And "assassinated" crosses "A. Lincoln" the only other time the name of the President who freed the slaves is encoded. The man who led India's fight for freedom from colonial rule, Mahatma Gandhi, is encoded in the Book of Exodus. 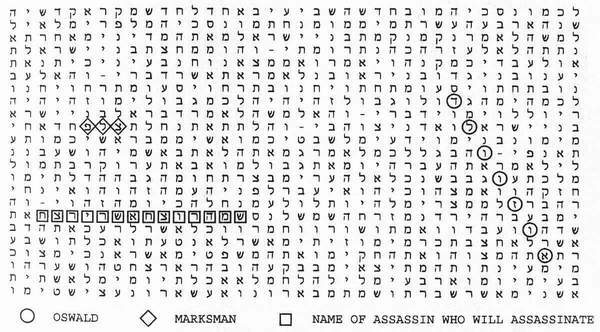 And his name, "M. Gandhi," is immediately followed in the Bible code by the words "he will be killed." The murder of the other leader in the Middle East who, like Rabin, is best remembered for trying to bring peace, Egyptian President Anwar Sadat, isalso encoded. His name, the name of his assassin, Chaled Islambuli, and the date of the assassination, October 6, 1981, all appear together. "Chaled will shoot Sadat" is on one table, and "he will assassinate" crosses "Sadat" on another where the Hebrew date "8 Tishri" also appears. Even the location, a "military parade," is encoded in the Old Testament. 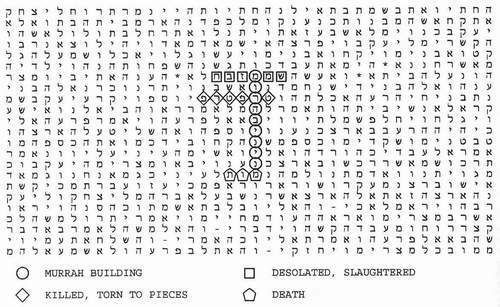 Three thousand years ago every major assassination of the past two centuries was foreseen, and accurately detailed in the Bible code. It was what I tried to tell Prime Minister Rabin, a year before he was also killed: "The only time your full name-Yitzhak Rabin-is encoded in the Bible, the words `assassin that will assassinate' cross your name. "That should not be ignored, because the assassinations of Anwar Sadat and both John and Robert Kennedy are also encoded in the Bible." The code said Rabin would be killed "in 5756," the Hebrew year that started in September 1995. The year was encoded with "Rabin assassination" and "Tel Aviv." And now, Rabin was also dead, as predicted, where predicted, when predicted. IF the Bible code was right, the "next war" would come after an assassination, but it would be triggered by an act of terrorism. The Middle East was the center of world terrorism, and each of the bombings, the murders, the massacres, was encoded in the Bible. The first attack I found was striking, because the 3000-year-old Bible code was ahead of the news. I was flying to Tel Aviv in December 1992, when the stewardess handed me the Jerusalem Post. On the front page was a banner headline, "Border Policeman Kidnapped." I immediately ran his name, "Toledano," on the search program in my lap-top computer. It appeared only once, encoded in the Book of Genesis. "Captivity of Toledano" stated the full code sequence. Adjoining the "d" in "Toledano" was the name of the city where he was kidnapped, "Lod." And the code also said, "He will die." The newspaper report said his fate was still unknown. The next day his body was found. Later, when transcripts of the captured terrorists' confessions were published, one of the Palestinians recounted the moments following the kidnapping. He said that there was an argument among the three terrorists whether to kill the policeman, and claimed that he told the others, "Don't shed blood." 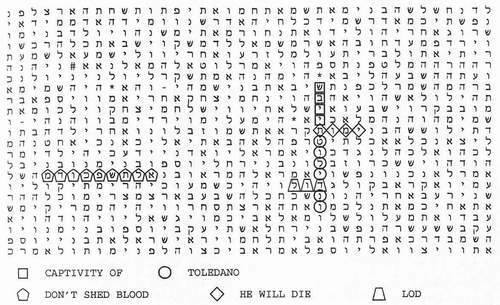 Those same words appeared with "Toledano" in the Bible code. The Bible code also foresaw the worst act of reverse terrorism in modern Israel, the February 1994 massacre of thirty Arabs praying at a mosque. The name of the killer, an Israeli doctor, "Goldstein," the name of the city where the murders took place, "Hebron," and the words "man from the house of Israel who will slaughter" all appeared together in the Bible. The site of the massacre reveals something about the ancient roots of the current danger in the Middle East, and how inextricably bound up it all is with the Bible. The mosque was built on top of a temple, which was built on top of a tomb. It is believed to be the tomb where Abraham and Isaac and Jacob, the Biblical patriarchs, are buried. It has long been a flashpoint in the Arab-Israeli conflict. In 1929, there was another massacre in Hebron. Palestinians rioted, and killed 67 Jews, driving the survivors from the city. That, too, was foreseen in the Bible code. "Hebron" appears with the year of the riot ("5689"), and the full hidden text states, "Hebron, that evicted them." Today, five hundred heavily armed Jews live in an enclave around the Tomb of the Patriarchs, and several hundred more in a nearby settlement called Kiryat-Àrba, surrounded by 160,000 Arabs. The Israeli settlers refuse to leave. They quote the Bible to stake their claim. Chapter 23 of Genesis states it clearly: "The field, and the cave that is in it, were deeded over to Abraham as a burying place." Abraham bought the land as a tomb for his wife, Sarah, and his family 4000 years ago. The Arabs don't contest the ancient deed. They just note that Abraham was, according to the Bible, also their father. The original words of Genesis state, "Sarah died in Kiryat-Arba, that is Hebron." The hidden text of the same verse states, "You will struggle in the city of the ambush, that is Hebron." But as the 20th century comes to a close, random murders, even massacres on the scale of Hebron, are not the real danger. Terrorists wielding weapons of mass destruction are the new threat. That threat emerged suddenly in two totally unexpected places, Tokyo and Oklahoma City. Yet both attacks were encoded in the Bible. On March 20, 1995, there was a poison gas attack on the Tokyo subway by a lunatic religious cult, Aum Shinrikyo. Twelve people were killed and more than 5000 injured when the Germannerve gas Sarin, developed by Nazi scientists, was released in subway trains during the morning rush hour. "The cult," noted a U.S. Senate report, "thus gained the distinction of becoming the first group, other than a nation during wartime, to use chemical weapons on a major scale." The committee vice chairman, Senator Sam Nunn, stated, "I believe this attack signals the world has entered into a new era. "Aum Shinrikyo" was encoded in the Bible with "subway" and "plague." The word "gas" was encoded twice in the same place. When Japanese police raided the religious cult's headquarters they found enough poison gas to kill 10 million people, every man, woman, and child in Tokyo. The Doomsday cult had world-wide connections, at least a billion dollars in assets, and in addition to the nerve gas had also stockpiled vast quantities of germ warfare agents, including anthrax. It had even sent a team to Zaire to collect the deadly Ebola virus, and also tried to acquire nuclear weapons. What might have happened-if Aum Shinrikyo's leaders had not been caught, its plans discovered, and its weapons seized-was also encoded in the Bible. "Tokyo will be evacuated" was the unfulfilled prophecy, the probability that was prevented. Encoded with "Tokyo, Japan" was the Biblical word for "plagues," the word used in the Bible for the Ten Plagues of Egypt, and the word right after that was "flying weapon." "Airplane squadron" was also encoded with "plagues," and the poison gas "cyanide" and the incurable virus "Ebola" appeared in the same place. Later, Japanese police reported that documents seized at Aum's headquarters showed that the cult was planning a massive assault on Tokyo, using manned and robot helicopters equipped to spray deadly biological and chemical agents. The group's leader, Shoko Asahara, predicted that the world was coming to an end. Before he was arrested, Asahara set a new date for Armageddon: 1996. The year encoded with "Tokyo will be evacuated" was "5756," the date in the ancient Hebrew calendar equivalent to 1996. A plague of Biblical proportions had almost been unleashed on Tokyo, and what might have happened was encoded in the Bible. ONE month later, at 9 AM, on April 19, 1995, a truck bomb blew up the Murrah Federal Building in Oklahoma City, killing 168 people, including 20 children. Within hours, the police arrested Timothy McVeigh, a former Army sergeant with ties to the militant right. The Oklahoma bombing was the worst terrorist attack in American history. It was encoded in the Bible in nearly the same detail it was reported in TV news bulletins. "Oklahoma" appeared with the words "terrible, frightening death" and "terror." The target was named: "Murrah Building." And with it there was a description of the horror: "death," "desolated," "slaughtered," "killed, torn to pieces. The chief suspect was identified: "his name is Timothy McVeigh." In fact, laid out like a crossword puzzle in the Book of Exodus were the charges filed against McVeigh in the April 19, 1995, massacre: "His name is Timothy McVeigh-Day 19-on the 9th hour-in the morning-he ambushed, he pounced, terror-two years from the death of Koresh." Government investigators claimed that McVeigh wanted to avenge the Koresh cult, an Apocalyptic religious group, most of whose members died in an inferno that ended their shoot-out with federal agents exactly two years earlier on April 19, 1993. And there was a disturbing echo of that cult's insanity in the verse of the Bible where the Oklahoma tragedy was encoded: "the terror of God was upon the cities that were around them." THE recent past was encoded in extraordinary detail. But the two questions that I had from the beginning-Could we find the details of events before they happened? and, Could we change the future? -were still unanswered. 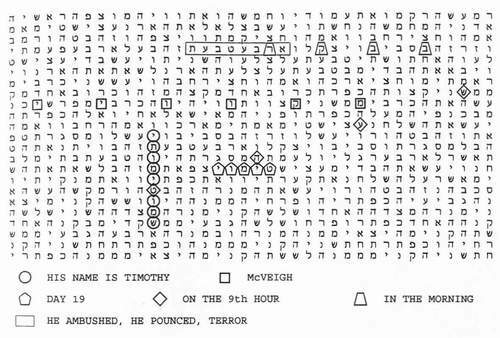 Timothy McVeigh had remained hidden in the Bible for 3000 years, and was found in the code only after he was charged with killing 168 people in Oklahoma. Yigal Amir could not be found in advance even though the Rabin assassination was predicted. Aum Shinrikyo's alleged plot against Tokyo was unknown until its leaders were arrested. So the big question still remained-If this really was the beginning of the "End of Days," what could we do about it? It was no longer just a philosophical musing. 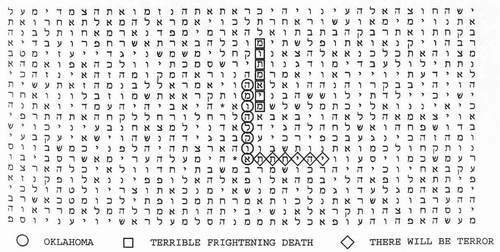 If the Bible code was right, and its record re: the recent past suggested it could be, this world might be about to face both man-made and natural disasters on a scale it had never seen before, events so terrible that nothing prepared us for it, except the long-known prophecies in the Bible.